If you've ever considered skiing in the United States, now would be a good time to do so! Mammoth Mountain, the holder of the highest snow total in the US at the moment are showcasing images and videos of the perfect skiing environment on their Instagram feed. 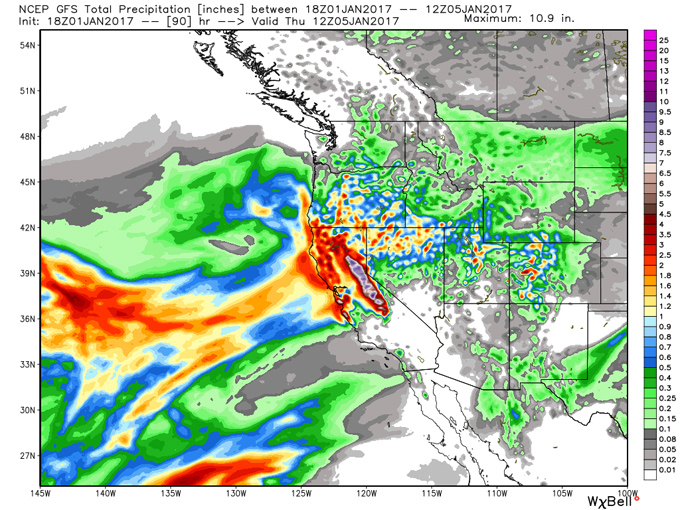 Insane ten day storms have delivered over twenty feet of snow to the Mountains of California. The flood of snow may have caused an emergency for some, but this is good as it gets for skiers. With now January being named officially the snowiest month in HISTORY. With no sign of easing up, the next set of heavy snow storms are expected to cover all of California's ski areas in an additional ten more feet of the good white stuff much to the excitement of experienced skiers. The forecast now is for more snow with fine weather and awesome conditions. Because of a unique system called an "Atmospheric River." This weather system that carries a narrow band of moisture, picked up in the Pacific and bringing it over the land and bringing in tons of snow and strong winds, the Northern California Mountains are now flooded along with the Sierras and the mountains of Washington state. While the past two major storms have been focused on California. There was a significant amount of snow falling across Utah, Colorado and Wyoming and all of which report some deep powder days. For the best resorts to visit, we recommend that you check out Mammoth, the Lake Tahoe area and more inland resorts like Jackson Hole in Wyoming, or any of the resorts in Utah or Colorado. Basically no matter where you go, your in for a good time! And with a solid base that has been built, it is expected to last well into spring. So it not too late to line up and book your dream trip. To get you ready, check out Jindabyne Sports for great ski trip deals. The worst thing about buying gear as you travel, is not finding the right stuff when you are there. We already have a vast selection of next years ski gear in stock to make sure you are ready ahead of time and can focus on what you want to do... Ski.